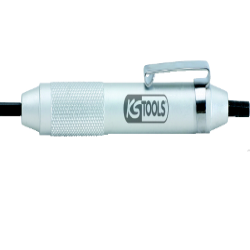 Prominent & Leading Wholesaler from Hyderabad, we offer automatic shut off screwdriver, pneumatic screw driver and double ended mirror screwdriver. 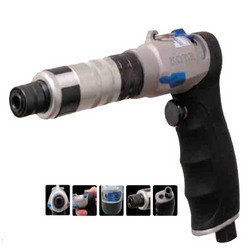 Automatic Shut Off Screwdriver is a heavy duty reverse action pistol grip screwdriver suitable for production and assembly applications. Push to start type with auto shut-off clutch for precision applications. Three interchangeable torque springs allow for easy conversion for new applications. 1/4” hex drive. External torque adjustment does not require disassembly of the tool. Variable speed throttle. Ergonomically contoured grip for operator comfort. Handle exhaust directs air away from the workpiece and operator. Hanging ring included. Chuck size: 1/4” (6mm) hex. Minimum air hose size (ID): 3/8” (10mm). Green torque spring:* 0.6 - 2.1Nm (5 - 19in/lbs). Black torque spring: 1.1 - 4.3Nm (10 - 38in/lbs). Yellow torque spring: 1.7 - 5.1Nm (15 - 45in/lbs). PneumaticScrewDriveris built on a frame of high torsion strength, which ensures accuracy drilling with high-powered feed. We supply these products, which are manufactured using quality stainless steel and brass alloys in accordance with international quality standards. These pneumatic screwdrivers appreciated for high performance, durability, dimensional accuracy and corrosion resistance. These product clients can avail from us at affordable price. 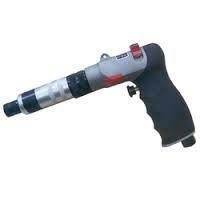 Looking for Screw Driver ?